However, you also have to be careful how you listen to, some actually have experience making money with websites and others don't. I'll let you judge for yourself, but I've personally built hundreds of websites and I've been making a full-time living from those websites since 2011. When many start-up websites launched (including Facebook, Twitter, Pinterest and others), they didn't always have a plan for how they would make money. Their primary goal was focusing on creating something that would attract attention and big traffic. First, we should make sure there is a market for our site (keyword research is big part of this). Secondly, we should try to create something of value. Finally, we should ideally find a niche that has money being spent in it. Today, I want to focus on different ways that you can make money from your website. If you already have a website that is getting a bunch of traffic, congrats! You can skip this section and read all about how to make money from all those visitors coming to your website. However, if you don't have a ton of traffic coming to your website or WordPress blog right now, I want to spend a little bit of time explaining how you can actually get some of that traffic…so you can then make money from your website or blog. This article isn't meant to be a complete step by step guide for building a site, but more of a general overview. If you want a complete tutorial on how to start a blog, go here. Or if you want an in-depth guide for how to build a niche website, go here. Instead, let's jump right into how to get traffic to your website. I'll cover 4 main areas for traffic: search engines, social media, paid traffic, and direct sources. Did you know that search engines like Google, Bing, and Yahoo will send traffic to your website for free if you can “rank” in them? If fact, you probably did a search similar to “how to make money with a website” and you found this article that you are reading now. I didn't pay for my article to be listed; however, it ranked naturally in Google for free. Ranking in search engines can be done through search engine optimization. If you want to explore that subject, I've written an in-depth guide for how to rank in Google right here. However, there is basically a 3 step process for ranking in search engines that you should consider when trying to make money from your website. First, you need to try and rank for keywords that are not too difficult. If you are trying to rank in Google for something that is extremely competitive, even if thousands of people search for it every single month, will lower your chances of getting any traffic at all. So, I recommend that you target long tail keywords that are much easier to rank for. Then you just target lots of different keywords by writing great articles and you will be more likely to show up. You can learn more about long tail keywords right here. The way that you target keywords is to write an in-depth article on the subject. 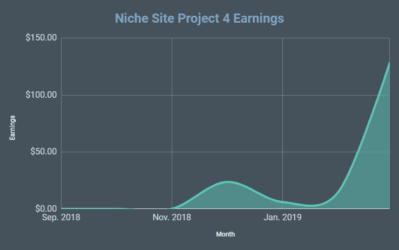 For example, I wanted to rank for the term “niche websites” and so I wrote a really in-depth article on the subject right here. As of today, I now rank #1 in Google when someone searches for the term “niche websites”. A backlink is simply where one website mentions another website through a link that you can click. These links act as “votes” to show that one website is more valuable than another. Google crawls the internet to see all the links that are out there pointing to your website and tends to rank your website higher when you have a higher quantity and quality of links. If you would like to learn more about getting links to your website, you can read a couple of articles here and here. Sometimes social media can be easier to attract than search engine traffic (at least in the short term) and in turn increase the revenue of their money-making website. In fact, many websites rely on social media for the majority of their traffic. So, if you don't want to worry about ranking in Google for now, there is another way. If you have a Facebook or Twitter account, you should be posting regular updates and following others. When it comes to Pinterest you should be regularly adding “pins” to your board and re-pinning others from other boards. Obviously, this is not meant to be a complete guide for social media traffic, but you can get one strategy that worked really well for me to quickly build a Facebook fanbase here. I think it's important to mention that if you truly work on building up a brand for your website, people will come back directly to your site by typing your domain in the address bar. This is direct traffic. If you consider how you usually get to Facebook.com, my guess is that you type it into the address bar or you have an app on your phone to go there directly. In addition, if people are linking to your website and their website gets a lot of traffic, they will be sending some of those people your way through what's called “referral” traffic. For example, in the image of my Google Analytics from the past couple of weeks below you can see that I received 7,302 referral visitors and 7,241 direct visitors. 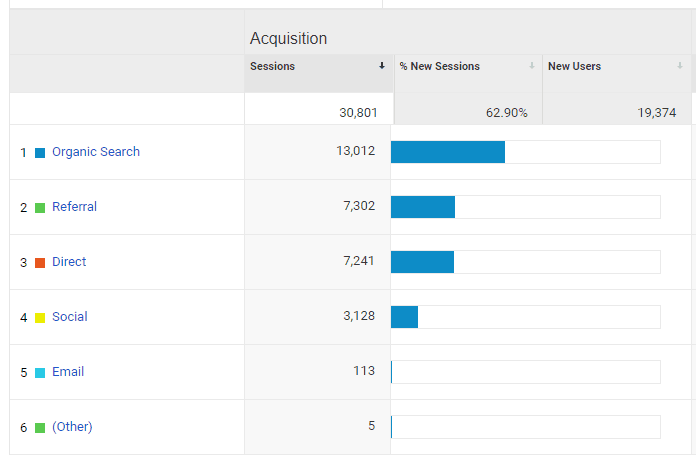 You can also see that I get the bulk of my traffic from search engines (organic search), but I clearly need to do a bit better with social media. Now, that I've shared a quick tutorial of how to actually get people coming to your website, I want to dive into how to make money with a website. In the past, I've primarily focused on Google Adsense for my own niche sites. I did try out a few Adsense alternatives, but I came back to Adsense because it's the one of the highest paying contextual ad networks out there. It's easy to implement, pays the most, and just works. Make More From Adsense: The best way to maximize your Adsense earnings is to test placements. I use a free tool called Ezoic which does this automatically, Click here to try it out. However, as I set out to start my very first public niche site project, I have decided to use something besides Google Adsense to monetize my site. When I first start a niche website, I'm not usually going to pick a particular monetization strategy until I pick a niche and keyword. Sometimes, I'll think that I would like to build an email list and monetize that list with affiliate offers or my own products. However, this is not set in stone, and could change as I pick my niche OR as I test different strategies on the same site. However, as you contemplate how you should make money from your new niche site, I will show how many options are out there. First, I'm going to list the general ways to monetize (categories like CPA, contextual ads, etc) and then I'll number off the specific networks or options within each of those general categories. Below I will share the 53 different ways that you can make money from your website. Pay per click ad networks literally pay you when someone clicks an ad on your website; whether or not they go and buy anything. This a great way to start making money online, from your website. Most of these are extremely easy to add to your website as well. You just sign up and get approved, then copy and paste a short snippet of code onto your website. 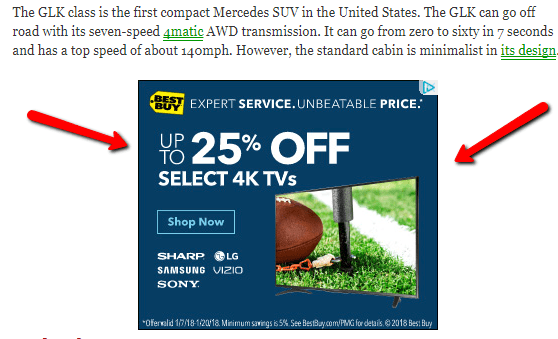 Media.net handles all the ads for Bing, Yahoo, and many other advertisers. I've had a few people claim that they are able to make more money online with Media.net than Google Adsense. Here's an example of what Media.net looks like. 7. Clicksor.com (both eCPM and pay per click). Key Takeaway: Don't just assume Adsense is your best option. Click here to sign up for Media.net and test both options. In reality, there are many more pay per click networks that you can use. However, these are some of the top options. If you want to see a more comprehensive list, go here. Rather than paying on a per click basis, these ad networks pay on a per view basis (usually a dollar amount based on 1000 pageviews). 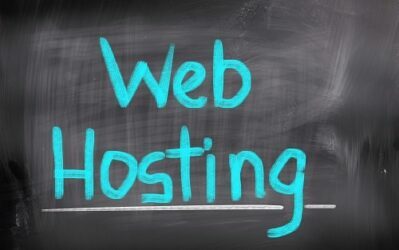 Most of these networks require that you have a large visitor base to be approved to their network; therefore most of these won't work for a smaller niche sites. Your ability to get into these advertising opportunities typically depends on how many pageviews your website is generating. So, if you have a website that is getting tons of traffic from Pinterest for example, you can monetize that traffic through some of the below CPM networks. (500,000 unique visitors per month required). If you have a website getting lots of visitors (over 100,000 pageviews a month), then AdThrive is an excellent option. I know of several people that were able to dramatically increase the earnings of the website by switching from Google Adsense to AdThrive. There are a TON more CPM ad networks out there, this is just a small sample. You need to find one that fits your niche or works best for your site. These types of ads pay a fixed dollar amount based on an action taken (like an email submit form filled out). Many of these ad networks listed below offer both affiliate commissions (% of the actual purchase price) AND CPA opportunities. There are also a LOT more ad networks out there than I could possibly ever list in this category – this is just a few. In general, these are great options if you are generating leads for businesses. A classic example is if you have people interested in refinancing their home. You might get paid $50 or more for each name and email address that you are able to refer to potential lenders through some of the below networks. Affiliate marketing is a huge business and it's a great way to make money online. This can be a good option because you get paid no matter what the person buys on Amazon within 24 hours (not just what you referred them to). If you happen to building a niche site, then I think this is an ideal option to get started with. Amazon has millions of products that you could write reviews on. In addition, so many people are comfortable buying products on Amazon (and may even have a Prime account), that it makes it really easy to refer buyers to Amazon. If you are curious to see some examples referring visitors to Amazon or how to use Amazon affiliate links, go here. You can also see my full guide to how to make money on Amazon here. (This is actually an in-content ad network, but it pays out based on actual sales made. 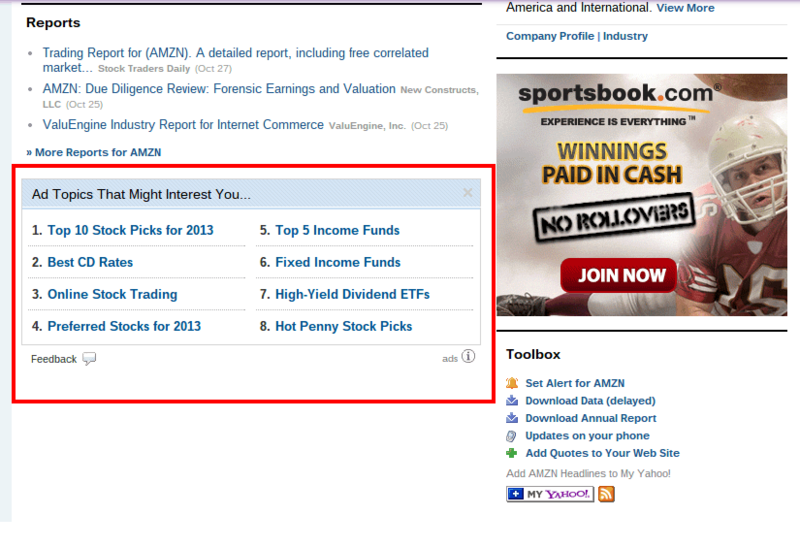 So its not a per-click basis, but does display ads automatically based on the content of your site. Its a pretty cool option actually that I've used and like). Thousands (yes thousands) of companies offer their own affiliate programs that are NOT listed in any network. These can be harder to find, but often pay very well. However, if you are in a certain niche, you will know the types of products that your visitors might be interested in. As a result, just do a quick Google search to see if those companies offer an affiliate program. Just type in “company name” + affiliate program, so something similar to find results. They have an affiliate program here. 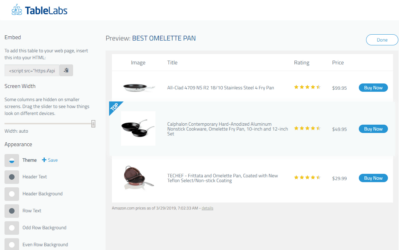 This is my own software product that makes creating product comparison tables for Amazon much faster. I run my own affiliate program here. This is probably the biggest category because you can also contact companies directly and ask to start an affiliate program with them or otherwise work out a deal with them directly. I've created my own niche site training course called Niche Pursuits Insider. You can see an example of how to sell a video training course by visiting my Niche Pursuits Insider page. If you want to learn how to self publish a book on Amazon, I written a guide for that. I was able to self publish a book and get it to $100 a day in earnings in a relatively short period of time. In addition, you can “publish” your book on your own website. A digital book can really just be a PDF file that you deliver to people once they pay. I know of several people doing really well publish small books and selling them for $47 or more on their own niche websites. I have created a couple of different software programs, and I can tell you this can be an excellent way to make money from your website. I owned and operated Long Tail Pro for 5 years before selling it. I currently own and operate Table Labs as well. 46. Create other tools, services, or information that customers are willing to pay for. 47. Launch and sell a product on Amazon. If you are interested in selling products on Amazon, you should check out how I got started selling on Amazon FBA. I was able to grow my Amazon FBA business from zero to a nice exit when I recently sold my Amazon business. This is a very common way for bloggers to make money. In a nutshell, brands will ask bloggers to write an article that reviews their product or that highlights their product in some way. The brands will pay anywhere from a few hundred dollars to a few thousand dollars per post. This is a great way for brands to get in front of the audiences that are trying to target. And this a great way to make money blogging. However, it's important that you notify readers somewhere on the article page that it is a sponsored post and that you received compensation for writing it. In addition, you need to make sure any links are “no followed”, and Google will then be okay with the sponsored post. Obviously this won't be right for everyone and many consider questionable. I personally would never sell links on my website, and I strongly advise you against the practice. Google can and will penalize your website so that it doesn't appear in the search engines if you are caught participating in buying or selling links. When all else fails, you can ask for money :). Many sites have done this in the past with varying degrees of success. Wikipedia is probably the most well known site that operates 100% on the donations of users. Even if you never monetize your site, you might be able to sell out for a pretty penny! If you build the traffic of your site or otherwise have an audience, there is value there. If the traffic is high enough, you could sell for a lot (think Twitter kind of traffic…). And of course, people buy brand new sites all the time that have no traffic or audience based on design and niche (but usually for very cheap). But for the most part all your options for how to make money from a website are going to fit in these main categories covered: Pay Per Click Networks, CPM Ad Networks, CPA Networks, Affiliate Networks, Direct Affiliate Programs, Selling Ad Space, Creating a Product, Sponsored posts, Sell Text Links, Donations, or selling your site. You can also find lots of other niche business ideas right here. Overall, I hope that you've found this list helpful as you begin your journey of building, growing, and making income from your website. The amount of money you can make from blog posts or your website in general usually comes down to your own marketing efforts. If you can attract a big enough audience or traffic source, then the ability to start earning money is very real. This truly can be a legitimate work-from-home opportunity. I would love to hear your thoughts! Did I miss any major money making networks or methods? Let's discuss below. I wrote a review about that product at my site. This list is not a reflection of whether or not I think any of these ad networks or affiliate programs are good or bad. These are just ways to make money from your site – options. Looking forward to seeing how you test which option is working the best. What tools you use for split testing etc. It can change a lot from niche to niche! Great list. Thanks a bunch. Only one chance to it. Adbrite have officially turned in their cleats. They are no more. Actually Adbrite is still alive and well. Just logged into my adbrite account to make sure – so unless I’m missing something Adbrite is still active. I received an email from AdBrite yesterday, they will be ceasing operations on February 1, 2013. Well, there you go – Adbrite is no more (updating post). They were a very low paying network from my experience anyway. Great post! I think you covered all the possible ways to make money (at least, all the ones I know). could be the most profitable, but the most time consuming! 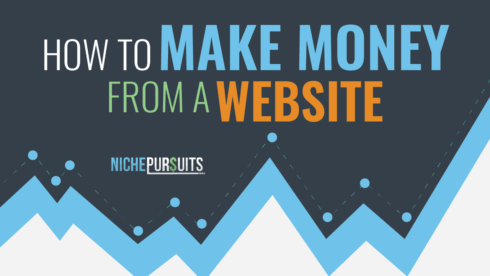 Great post as always and massive collection of tips to make money from a website too! What I think about making money from a blog is that unless you know how to sell none of the monetization strategies can help you make money from blogging. The key here is to learn the art of selling without sounding like a sale guy. Another important thing to remember before monetizing a website is that you should come up with a blog sales funnel and know how to convert your website visitors into leads and then into customers before you even launch your blog. That’s how you will get better ideas on how you can leverage your website traffic and make the most out of it by making money. For me affiliate marketing works like a charm and I usually make around $5,000 every month through my blog. Apart from affiliate marketing, we also use product reviews, brand collaborations and sponsored posts etc to make money from our website. 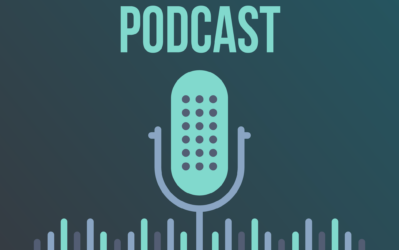 Thanks for sharing so many monetization strategies with us and I am finding some of them really new to me even though I’ve been blogging for over 6 years. Keep up the great work and post such awesome content regularly. Wow, I’ve been an affiliate of Hostgator for well over 4 years. They have never missed a payment. Response is super fast too. Media.net is actually a good option. I’ve been using it only a very little the past few months, but the payout is better than infolinks or kontera from what I can tell. Still not as high as Adsense, but a good alternative. I still believe that making money online is much easier than working offline. As someone who has been successful, do you have any recommendations for me? Great post Spencer – I’m glad to see a list of PPC and CPM companies. 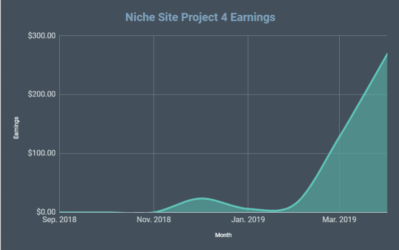 You might think about adding MoreNiche to your list of affiliate networks – I’ve found them excellent for monetising health and beauty type sites. I agree. I could have gone a lot deeper, but there are SO many that I never could have covered them all. Wow, Spencer – you’ve outdone yourself here. This post is absolutely getting bookmarked. I’ll be going through this list and seeing if they make sense for some of my sites. I wonder how using the YouTube partner program would fit in with this list? While it’s not exactly on your site, the views you could get on your site would help, no doubt. Anyway, just thinking out loud! Cheers! Good point on Youtube…I’m not very knowlegeable on that one. Although, doesn’t Youtube use Adsense to monetize their videos? Anyway, if someone has a video site or produces videos, they should absolutely look into that! Quite the list! I appreciate the quality effort and time that went into creating it. It is a great list of ways for making money online. But as beginner, I feel to have to focus on one way. It takes more time to be successful. That is what I experienced. Could you give me advice to make better? Thank you. Definitely remarkable, particularly the potential Adsense substitutes. Media.net has been especially noted and I will be checking it out one of these days. Great list Spencer, helps to get the mind thinking more broadly…the more options, the better! FlexOffers is a pretty decent CPA network with tons of goodpaying advertisers from several different niches. I was wondering what your opinion was on whether its a good idea to monetize a single from a few different places? E.g Adsence plus affiliate network. Or is it better to stick to one stream per site? I would test multiple monetization methods, see what combo pays the best. I one of your post https://www.nichepursuits.com/how-to-get-a-google-penalty-using-affiliate-links-and-how-to-recover/# you told about affiliate link penalty. I noticed that Google penalized all my sites one by one for affiliate links. But I have only one link – not 100 as you said. The penalty is -30 position for my “domainname” query. How do you think what can I do in such case? I don’t think its a penalty based on your affiliate links. Its probably a penguin or panda penalty. Honestly you are my legend! Have been looking for a simple to read list of ways to make money online! Now just have to see if I can make a nice income! Been investigating all the options for the last week and ended up applying for infolinks and media.net. I have tried Adsense before but I am only now seeing some traffic improvements on my site so I guess I will go with them 1st. What would you specifically recommend for a website like mine dealing with entertainment, music and movies? pls tell me how can i make more online money by my educational site. Really useful stuff.Thanks for the info. I just started looking into all of this. It’s all a little confusing as to the different choices but I’ll be checking out a few of the options that you posted. Can someone help me in information to create the correct website and what must be on thet site, and how to put links on the site to make money. It’s a great list. I have used few of them. Small FYI. I went to the link you posted for Google Affiliate Network and got this. We’ve made the difficult decision to retire Google Affiliate Network and focus on other products that are driving great results for clients. For more information, please read the full announcement. Fantastic write up so many good ideas. Thanks for the post and the ideas on how to make money online. I am busy to make money online work from home. Now I`m a boss of my own business. I found a financial directory that’s useful for info on making money online. It’s http://money.madbeetech.com. What I like about it is that each directory listing includes ebooks and videos that can be instantly downloaded. The two things only I know for making money online those are AdSense and Affiliate marketing. But you gave beautiful list of sites that will help us to earn more. Thanks for your detailed article. Another great CPM network is Mediavine. I’ve been using them recently and the rates are much higher than Adsense. They are more picky about which sites they approve, but it’s worth a shot if interested. I am only experimenting with affiliate marketing to start with. When do you think it’s time to start with adsense too? Or should I just start immediately, regardless of the low volume of traffic?